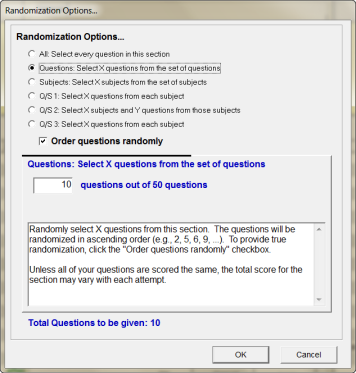 Whether creating tests, exams, assessments, papers, quizzes or surveys, Test Generator enables test authors to apply a range of randomization options to a test. Choose from multiple randomization settings. You can define the number, order and grouping of questions presented in your tests. Randomization can be individualized based on your audience, type of test or testing environment, computer lab, proctored testing environment or home. n addition to the randomizing of questions and answers in a test. Test Generator's Test Wizard enables you to create a test and randomly select X question banks and then select X questions from each question bank. All: Select every question in this section. X subjects from the set of subjects contained in the test. The same number of questions from each subject in a test. A subset of questions from each subject set. 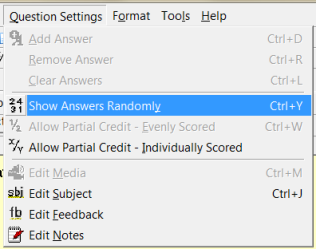 You can randomize answers for Multiple Choice, Check Boxes, Ordering and Likert question-types. You can create tests containing multiple sections. Each section contains randomization properties allowing you to randomize each section or individual sections.